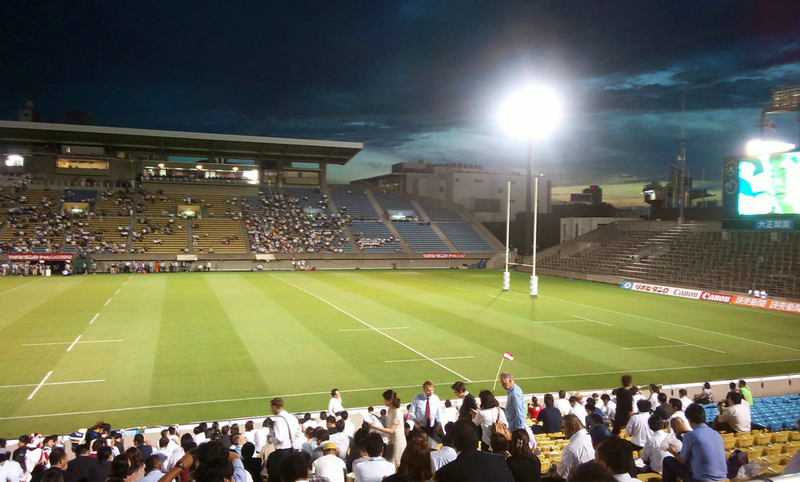 In an effort to gain international experience, Japan XV played a strong French Barbarian side in the first of two legs, and CRU were of course in the stands. Contrary to last weekend’s spirited start against Samoa, Japan looked a bit shell-shocked from kick off and let in the first try after 2.5 minutes. Fielding many experienced players, the Barbarians dominated the scrums and showed some excellent passing skills in attack. Japan got agonizingly close to the try line several times but were held up short, while the French were ruthlessly efficient at the other end. Apart from excellent kicking, the Barbarians were flamboyant on the wings and Benjamin Lapeyre – sporting an impressive Mohawk – broke through twice in the first half to seal a comfortable 32-7 lead before the break. Rumor had it that the Barbarians, who arrived on Saturday, had mapped every bar in Roppongi by Sunday and would tire in the second half, and this proved in part true. It was also a more spirited Japanese side who came out in the second half and soon reduced the gap by 7 points. Another try on the board and Japan would have contact, but again they were held up inches from the try line, and Barbarians could add a penalty to lead 35-14. In the end, Japan won the second half and ended up losing honorably 21-40. French Barbarians won fair and square by beating Japan where they should be best – on the wings. Let’s see if the Cherry Boys can bounce back for the return leg on Sunday and give the French a proper fight. It would help, of course, if the audience would join in and cheer their boys on with more than polite tennis applause.